Art Tooth, in partnership with Artspace 111 and Ro2 Art, is excited to present The Pop Up Print Project. Join us in a temporary exhibition space constructed on the streets of Magnolia especially for Arts Goggle featuring works by Dennis Blagg, Daniel Blagg, Hillary Dohoney, Carol Ivey, Brian Jones, Melissa Mohammadi, Devon Nowlin, Brian Scott. Chip Tompkins, and Jay Wilkinson. Don't miss out on creating an opportunity to take home works by some of Dallas-Fort Worth's most esteemed emerging, mid-career and established artists. Each participating artist will have one work on view with only fifty corresponding signed, limited edition prints. If all editions are purchased by the close of Arts Goggle, special contest instructions supplied by the artist will be given to the print collectors for one person to win the original work. Since its inception in 1980, Artspace111 has evolved into a dynamic contemporary art gallery located on the outskirts of downtown Fort Worth. The gallery is dedicated to making contemporary art approachable to individuals of all ages. Artspace111 focuses on emerging and mid-career Texas artists working in a variety of media. In addition to monthly exhibitions, artists working studios add to the unique appeal of the gallery. It is here that artists are able to come together and create not only art, but also a community. Mother-and-son partners Susan Roth Romans and Jordan Roth operate Ro2 Art, a contemporary gallery and art advisory in Downtown Dallas, representing a diverse group of emerging, mid-career, and established contemporary artists, many with ties to the North Texas Region. Situated in the historic Cedars district of Dallas, the gallery also participates in public exhibition programs in partnership with Downtown Dallas, Inc., The McKinney Avenue Contemporary, and The Town of Addison. Ro2 Art has been named Dallas Observer's Best Art Gallery and was presented with the 2012 Obelisk Award for small business by the North Texas Business Council for the Arts. Ro2 Art is a proud member of CADD, the Contemporary Art Dealers of Dallas. Since its inception in 2003, ArtsGoggle has evolved into a popular festival of the arts in this eclectic neighborhood of historic elegance and urbanism immediately south of the central business district of Fort Worth. This free to the public, family-friendly event attracts a crowd as diverse as the neighborhood itself with live music, artistic displays of every kind, food, drink, and fun for everyone. Daniel Blagg, a native of Texas, is constantly influenced by the surroundings of his studio warehouse located in on the outskirts of downtown Fort Worth. 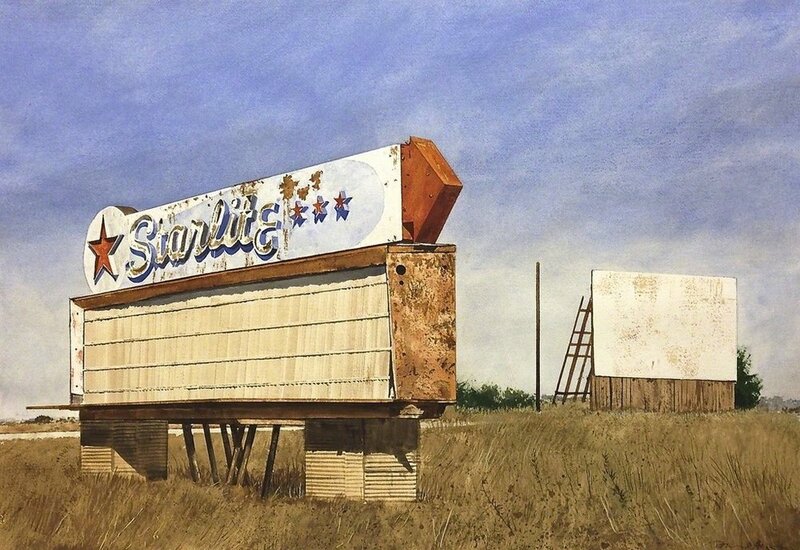 Blagg’s urban realist paintings depict abandoned buildings, decaying gas stations and empty streets. Drawn to these neglected areas that are in a state of limbo, his perspective elevates and reflects elements of Americanism both ordinary and sublime. In addition to having been a Hunting Prize finalist, Dan Blagg's work has been collected by the Modern Art Museum of Fort Worth, the Art Museum of South Texas in Corpus Christi, Shell Oil, Fidelity Investments, and the Coca- Cola Company. Dennis Blagg and his realistic paintings capture the essence of nature in a duality, exploring both the beauty and menace. Blagg explains, "The desert represents a landscape of broken promise, yet it is a place of vast spiritual content . . . an emptiness waiting to be filled". Self-taught and residing in Fort Worth, Blagg has been exhibited throughout Texas and New York City, and his resume is filled with over thirty public and private collections including: Museum of South Texas in Corpus Christi, Museum of Fine Art Houston, and the Modern Art Museum of Fort Worth. After completing a massive 42-foot painting for DFW Airport's International Terminal D, Blagg has taken a more intimate approach to his breathtaking, near-photographic portraits. Hillary Dohoney, a graduate of Trinity University, is an artist from Fort Worth, Texas. Mainly working with oil paint, she takes the classical approach of trompe l’œil to render unconventional entities. Her work has been exhibited in Paris, Arkansas, San Antonio, Houston, Dallas, and Fort Worth. She was recently a finalist for the Hunting Art Prize. Carol Ivey is a native Texan currently living in Fort Worth. She has an art degree from the University of Texas at Austin and has been exhibiting her painting for more than three decades. Carol has shown at the Albuquerque Museum, the Amarillo Museum of Art, the Aspen Art Museum, and Laguna Gloria Art Museum (now the Austin Museum of Art). Her work is included in many private collections as well as the corporate collections of Frito-Lay, Texas Instruments, and Baylor All Saints Medical Center, Fort Worth. Brian K. Jones earned a B.F.A. from The University of North Texas in Painting. In 1990 he joined forces with U.N.T Printmaker Brian K. Scott to form the acclaimed duo Chuck & George. He has exhibited both separately and collaboratively throughout Texas and also nationally, including New York, Chicago, and Los Angeles. He and Brian Scott were honored with the 2013 Dallas Observer Mastermind Award. Melissa Mohammadi earned a BFA with a concentration in painting and printmaking from Rhode Island College and an MFA from Southern Methodist University. Her work is influenced by time spent working on a horse farm tucked under impossible green hillsin Ireland, and traveling alone to Turkey to study Islamic and early Christian art and architecture. She has enjoyed the generous support of awards including the Meadows Scholarship Award, the Cerrino Fellowship, and the Rigsby Grant. Her work has been exhibited nationally. Devon Nowlin, a Fort Worth native who holds a BFA from the University of North Texas and an MFA from Texas Christian University, explores relationships of figures, forms, and concepts through painting and multimedia works involving soft sculpture, collected print material and photography, and drawing. Her imagery is informed by notions of gender, the gaze, and the inherent experimentation of an artist's practice. Nowlin has taught at TCU, The Modern and the Rachofsky Warehouse, was the gallery manager for The Art Galleries at TCU and is now Assistant Registrar at The Amon Carter Museum of Art. A co-founder of art collective HOMECOMING! Committee, she has exhibited at the 2013 Texas Biennial and the Dallas Museum of Art. Her mural, commissioned by Fort Worth Public Art can be viewed on the Trinity Trails' Clearfork Main Street Bridge. Brian K Scott has been an active artist in Dallas-Fort Worth for over two decades, which has led to a remarkable list of titles including Assistant Director of CentralTrak: The UT Dallas Artists Residency, founder and a principle artist of the Art Services Collective, co-founder of the Oak Cliff Studio Tour, and two decades of collaboration as half of the duo Chuck & George. His mordantly funny work has been exhibited throughout the country including LA, NYC, and Chicago. He is represented by Ro2 Art. Jay Wilkinson is an interdisciplinary artist working in painting, sculpture, and installation often using found objects to create large-scale, imaginative works that provoke conversation about social justice issues. Wilkinson has created several murals throughout Dallas-Fort Worth, often in partnership with street artist Jeremy Joel. In addition to his studio practice, he is a co-founder of art collective Bobby on Drums and has co-curated several Fort Worth exhibitions including Apples, Bobby on Drums and 100 for 100. Wilkinson, who resides in Fort Worth, has studied at the Pratt Art Institute in Brooklyn, NY and the University of North Texas in Denton.